Scientists have designed a new drug compound that dials down inflammation, suggesting possible future uses against autoimmune disorders such as rheumatoid arthritis. The new inhibitor is more selective than other compounds designed to target the same inflammatory pathway, according to new research from Washington University School of Medicine in St. Louis. Such precision, along with other beneficial characteristics of the new inhibitor, may improve upon some of the downsides of current therapies. The study appears online in the Journal of Experimental Medicine. A protein called p38 MAPK, when working properly, is responsible for helping tissue remain healthy, but if the protein becomes chronically switched on, it creates collateral damage, attacking the body's own tissues. Autoimmune disorders such as rheumatoid arthritis and psoriatic arthritis can result. Because the protein drives inflammation in many disorders, several drug companies have developed anti-inflammatory compounds that block its signaling. While these compounds have an anti-inflammatory effect for a while, the body recalibrates and inflammation returns after a period of time. "Because of the protein's role in inflammation, pharmaceutical companies wanted to block p38 MAPK and developed drugs to do so," said senior author Gabriel Mbalaviele, associate professor of medicine. "The drugs appeared to do well initially in small clinical trials, but the drugs' effectiveness collapsed at later time points. Markers of inflammation went down at first, but after two or three weeks, they went back up. We wanted to develop a compound that is more precise, just blocking the portion of the pathway that we now understand drives inflammation and nothing else." Rather than blocking the entire pathway, the new compound—called CDD-450—hits just one of several branches a bit downstream of the p38 MAPK protein. Blocking that pathway while allowing the other branches to operate freely may remedy the inflammation recalibration problem. Studying mice, rats and human cells, the researchers showed that the new compound reduces levels of inflammatory signaling molecules. 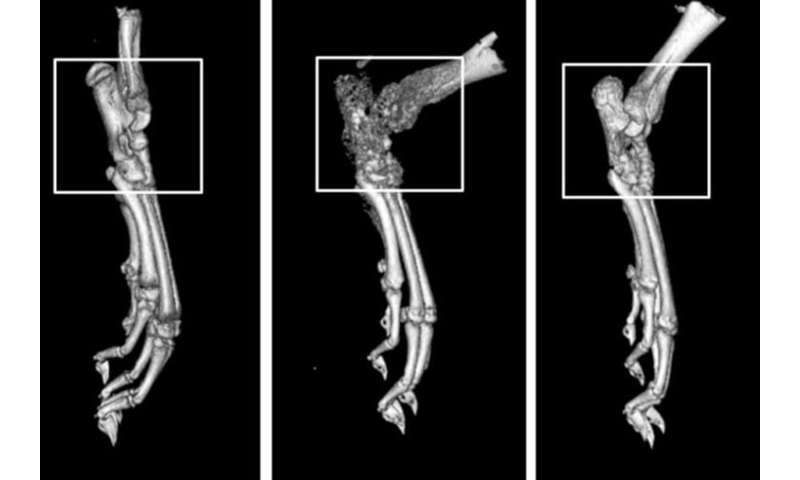 The scientists further showed that it prevents the destruction of bones and joints in a rat model of rheumatoid arthritis. "This compound—developed by an independent company called Confluence Discovery Technologies Inc.—is novel because it is not a global inhibitor of the p38 MAPK protein," said Mbalaviele, who co-founded the company. "It only blocks the p38 MAPK-MK2 downstream pathway—the one that drives inflammation. And more importantly, we showed that it blocks these signals in a rat model of inflammatory disease, preventing the bone loss and joint damage that is characteristic of rheumatoid arthritis." Further, the new compound does not have the downsides of some anti-inflammatory drugs currently in use, Mbalaviele said. Some relatively new anti-inflammatory treatments, called biologics, must be injected into the bloodstream, which makes them unpopular with many patients, according to the researchers. Another downside of biologics involves the immune system. Biologics are made of short protein sequences. Consequently, the body's immune system may recognize biologics as foreign and eliminate them, resulting in a buildup of resistance. In contrast, the new inhibitor is a small molecule bearing no resemblance to proteins. CDD-450 is a chemical compound that could be taken by mouth and could avoid an immune response, therefore maintaining its effectiveness, Mbalaviele said. He and co-authors Shaun R. Selness and Joseph B. Monahan founded Confluence Discovery Technologies in 2010 to boost development of drug compounds as potential new therapies for inflammatory diseases. In late 2017, Confluence was acquired by Aclaris Therapeutics Inc., which is continuing that work. Monahan and several other co-authors of the current study are employees of Confluence. Mbalaviele reports serving as a consultant for Confluence. "The company is moving toward early clinical trials to test the safety of CDD-450 (now called ATI-450) in people," Mbalaviele said. "My lab will continue to study these inflammatory pathways so we can develop a better understanding of how these signaling molecules lead to bone destruction and other detrimental effects of autoimmune disease."